Today Amsterdam is a bit sleepy and sluggish. Or maybe it's just me. I'm looking forward to the weekend and really truly need to spend some quality time in my library or behind the sewing machine. Or both. The weather is a pretty oppressive, mostly dark and ominous. A few bright streaks of sun that vanish as quickly as they appear. It feels like it's going to bucket down any second. Luckily I was lazy and took the tram to work this morning (but I was at least good and studied Spanish all the way). I'm secretly hoping it's crap weather all weekend so I can stay in and just potter about the house and make some stuff. Just feel like one of those weekend. Anyway, enough prattle. 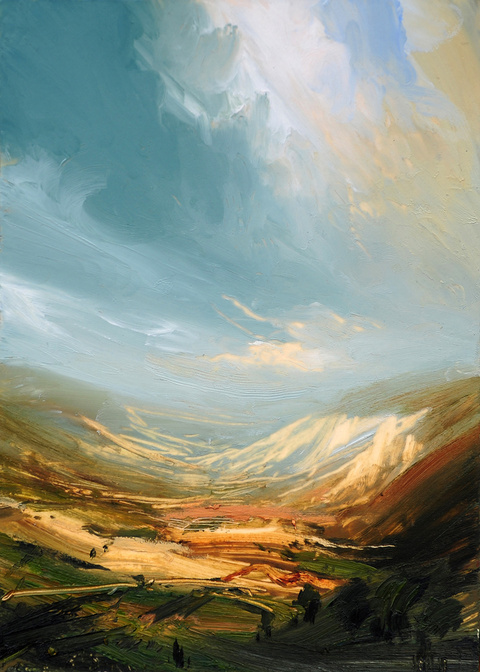 Above is Distant Valley, a print by James Naughton for Tiny Showcase. I'm sorry to say the limited edition of 100 is sold out. But I think James is someone to keep an eye on. His work ace. Captures the light so perfectly. Amazing.